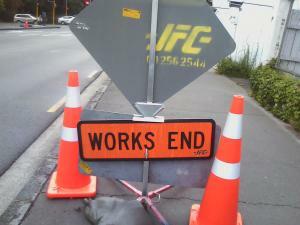 The attached sign says "works end" but it never started. The placement of the sign was after footpath upgrade started between Grafton bridge (Park Road) & Stanley Street. But there seems to be a problem here, you are not allowed to do a right turn coming up on Grafton Road from Stanley Street direction and turn into Grafton Bridge. So I would say this would be superfluous "sign distraction" for "live" motorist, something that a absolute no - no for motorist, even if it goes out of the way to injure real pedestrians.